Staying focused is one of the most important keys to success in a game of golf. The sport is predominantly a mental game. Sure, it requires physical strength, a strong foundation of fundamentals, and impeccable technique. However, all of these aspects are dependent on one thing: your mental focus. 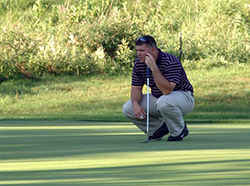 Golf is a slow-paced game, so your focus on technique can make or break your performance. Have you ever wondered why your scores aren’t consistent on a familiar course or why you’re suddenly making mistakes on your swing? In most cases, it’s because something has distracted you. 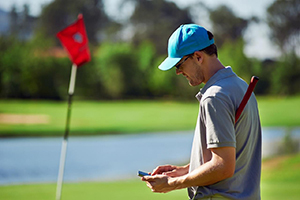 Whether it’s a flying bird, a golf cart in the distance, or something from home replaying in your mind, it’s important to free yourself from all distractions so that you can focus on the game at hand. While it may seem like an easy task, it can be one of the most difficult things to grasp when you’re playing golf. Here are a few ways to stay focused on your game. It’s important to leave thoughts and issues behind when you hit the course. If you’re worried about something that happened at home, you can become increasingly anxious on the course. This will pull your attention away from the game and cause you to perform poorly. Golf should be your getaway. When you step onto the course, leave all your thoughts behind. While it may seem difficult, it’s an important thing to try. If you can’t let go of something from home or work, take the time to resolve it. Let those emotions out so that they don’t bottle up and cause you stress. Acknowledge what you’re feeling so that you can feel relaxed once you start playing. You can also spend some time on the driving range to practice your swing prior to starting your game. Doing so will let you get the anxiety out comfortably while also helping you to exercise your skills before you start playing. When you step up to the ball, you should focus on nothing else. Pay no attention to the many distractions around you. It’s a good idea to take your time before you swing. 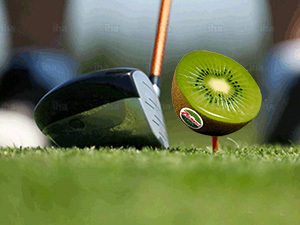 Golf is a slow game, so what’re a few extra minutes blocking out the sounds and visuals around you? One method that many skilled golfers use it to visualize what’s about to happen. You can visualize where the ball is going to go, how you’re going to swing, and how the ball will travel to get to where you want it. Doing this can calm your nerves and keep your mind in check. If you find yourself getting distracted, be aware of what pulled your focus and start the process over again until you’re ready to swing. One common problem many golfers face is focusing too much on a shot that didn’t go as planned. It’s important to accept the results of a shot no matter what and move on. Thinking about a failed swing will eat away at your confidence and affect your next shots. You shouldn’t think too much about how the swing will affect your overall game. Instead, concentrate on your next shot. One method to getting over that frustration is to just let your emotions and frustrations out for a brief moment before moving forward. After a swing, purge that bad energy. Feel free to scold yourself or let out a sigh of frustration. Doing this can help you get over the failed swing pretty quickly. When you’re walking to the ball, clear your mind and stay positive. This technique is used by many professional players. A routine of simple actions can help you focus on the ball, forget your previous swings, and block out distractions. It doesn’t have to be anything too complex, but rather something that you’re comfortable performing prior to each shot. Many routines involve short and simple breathing exercises. Being aware of how you’re breathing can keep you relaxed. You can then easily transition that focused energy to the game. Having a routine is a great way to create consistency. It’ll become an essential activity that prepares you for your next swing. Over time, this routine will be an integral part of the game. If something distracts you during your routine, simply step back and start again. While most don’t realize it, what you wear to the course can have an effect on your performance. Even the slightest discomfort can pull your focus away from the ball and hinder your movement. When it comes to footwear, wear something that’s comfortable and waterproof. The last thing you want to deal with is wet socks and constant slipping. With the right pair of shoes, you can stay stable and comfortable in any weather condition. The same goes for your clothes. You need options that fit you correctly and give you a full range of motion. Tight-fitting clothes can prevent you from making the movements you need to implement your techniques. Even a slight snag on your shirt can be detrimental. It’s good to go with well-fitting clothes with just enough fabric to feel free. There’s nothing more distracting than a growling stomach. Before you hit the course, it’s important to eat properly. Games can last for hours, so you’ll need the right fuel to stay comfortable and attentive. Like with any sport, proper nutrition is key. You should eat a meal that’s high in protein and low on carbohydrates. Protein can give you consistent energy to stay alert. It’s also vital for good muscle health and development. Carbohydrates should be avoided because they burn up too quickly. While you might feel great when you first hit the course, those carbohydrates will quickly lead to an energy crash that’s hard to recover from. If you’re in need of an energy boost, go with a small snack that’s rich in protein while you’re on the course. Staying focused while you play is one of the biggest hurdles you need to overcome. Even with all the training and skills in the world, they’re nothing if you can’t stay focused and play consistently. While it may take some time and practice, improving your mental acuity can make all the difference. With these tips in mind, you’re well on your way to mastering the mental game.